You know that the overall health of your skin is important. Rash. Has your skin broken out in an itchy, red rash? This can indicate you’ve come into contact with an allergen or you might have an infection. In most cases, these types of rashes resolve on their own, but in some cases, they warrant a visit to the dermatologist. See a doctor right away if the rash is all over your (or your child’s) body (it could be an infection or a serious allergic reaction), is accompanied by a fever (it could be scarlet fever, measles, mononucleosis or shingles), blisters or turns into open sores, is painful, or shows signs of infection (yellow or green fluid, swelling, pain, crusting, warm to the touch, a red streak). “Butterfly” rash on face. A telltale sign of the autoimmune disease lupus, a butterfly-shaped rash across the cheeks and bridge of the nose should be evaluated by a doctor. Lupus can also cause other skin issues, such as sensitivity to the sun, flaking, red spots, or a scaly, purple rash on the face, neck or arms. Yellow skin. A yellow tint to the skin may be a sign of jaundice. Jaundice occurs when there is a build-up of the yellow pigment bilirubin in the blood. Normally, the liver processes bilirubin, so excess bilirubin can indicate a problem with the functioning of the liver. Atypical mole. A new mole or a mole exhibiting one or more of the ABCDE signs could be an indicator of melanoma skin cancer. Loss of elasticity. Especially in babies and small children, the skin can be an indicator of dehydration. Dehydrated skin loses its elasticity. To check for dehydration, do the skin pinch test. Gently pinch the skin on the back of the hand. If it returns to normal right away, the skin is well-hydrated. If the skin remains pinched even after you let go, this indicates moderate to severe dehydration. Psoriasis. Sometimes autoimmune issues present themselves first in the skin. For example, individuals with psoriasis, an autoimmune disorder affecting the skin, may also develop psoriatic arthritis or other health problems affecting the heart, kidneys, lungs, liver or pancreas. Chronic dry skin. Dry skin can be caused by the environment or too much hand-washing, but when skin is chronically dry outside of these conditions, it can indicate other health problems, such as an imbalance in blood sugar levels or liver, kidney or thyroid issues. Skin changes related to Type 2 Diabetes. There are several skin changes that can occur with prediabetes or diabetes. Acanthosis nigricans is a dark velvety patch of skin on the back of the neck, armpit or groin that appears when insulin levels in the blood are too high. Diabetic dermopathy are light brown round or oval patches on the legs caused by changes in small blood vessels that feed the skin. Blisters, skin infections and wounds that won’t heal are also telltale signs of diabetes. Pain or sensitivity. If a light touch to your skin feels painful or bothersome (allodynia), these sensations could be a sign of something more serious. Skin sensitivity is often associated with fibromyalgia, migraines, shingles or peripheral neuropathy. Blue skin. Skin can turn blue in extreme cold, but if your skin takes on a bluish or purplish tinge at room temperature, it can indicate a form of heart disease. Called cyanosis, this color change occurs when blood vessels are blocked. Toes are often affected (“blue toe syndrome”.) A blue or purple net-like pattern on the skin also indicates compromised blood vessels. There are several other skin changes that can be warning signs of untreated heart disease. See a doctor if you experience any. 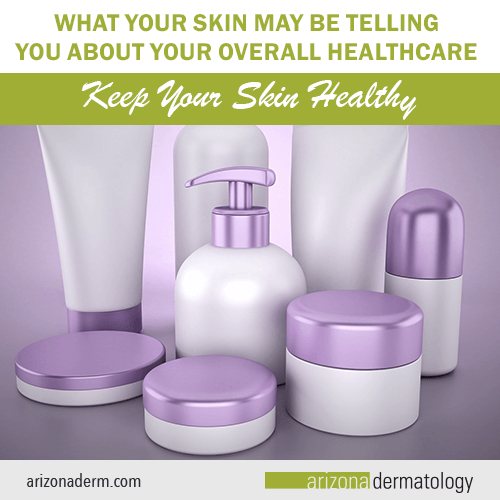 Not all skin changes mean a serious health problem, but if your skin is talking to you, listen to it. Most health conditions are treatable, and the sooner, the better. If you have a skin issue that is causing you reason concern, or any suspicious marks or moles, it is important to seek medical attention at once. Please feel free to contact our office to make an appointment with one of our providers today…your skin will thank you for it!